Edit: Oh, here they are. Mitewing and Faruga like this. Cool! 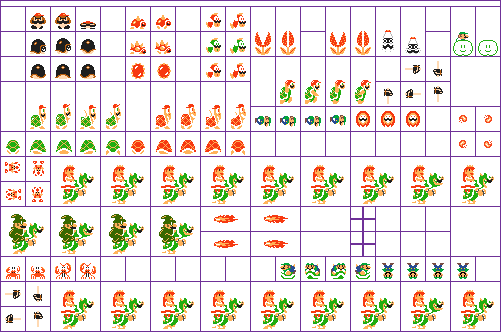 Another good idea for a Skin set would be based on the Miiverse stamps, especially found in SMM and the NES Remix games. The previous one made my eyes bleed because of the ugly pink background so I did my own version with the rest of the enemies added too. Uses SMM's palette, and I'm not going to bother with recoloring since it won't be added anyway. It's also missing the fighter fly and fire things because didn't feel like making new sprites for them, and the sidestepper just uses it's mystery costume sprites for the same reason. If anyone wants to finish it up then feel free. Mitewing and Jay like this. Wonderful job! If I may make a suggestion. What about making Costume Mario Skins. The two that come to mind is Link and Samus. Big Mario would be Zelda II Link with fireballs from that game and Samus would be her standard sprites with the Wave Beam as her fireballs. Second: Costume Mario is a big maybe. I could easily do a skin for every Costume Mario set in about a day - but since they require big Mario sprites, I'd rather not have a bunch of incomplete skins. If I were to make a whole skin around a costume I'd rather do someone who isn't in the game already. I'm thinking about doing Builder Mario. Yeah. I understand about the the big sprites. That's why I suggested Link and Samus since they have big sprites you can use. Builder Mario is a great idea. It shouldn't be too difficult creating big sprites for that. The Fighter Fly is a costume now.